Adam Roud returned to live and work there after graduating from John Mores University Liverpool studying fine art. 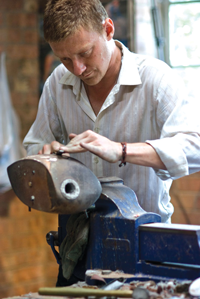 Initially working at The Morris Singer foundry learning the process of lost wax and sand casting, where the Major figures of the last century have had their sculpture cast, Hepworth, Caro, Paulozzi, Frink, Nemon and Henry Moore! With the completion and instillation of Lord Rockley’s Red Deer pieces from 2013 he has given his patronage to allow full time commitment to the studio and career.